Touching is very much in vogue these days, but if you plan to do a lot of typing, whether it be texts, notes or even novels, there's still no real substitute for the tactile response of a full, hard-key QWERTY keyboard. And it's the keyboard that dominates the Nokia E71. 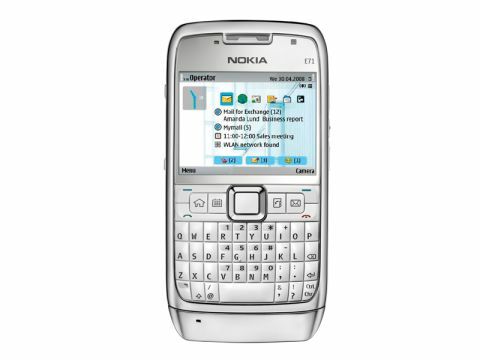 Smaller than its predecessor, the E61, Nokia has still managed the trick of making it perfectly easy to use, with nicely curved rubberised buttons and bright backlighting which, thanks to a clever light sensor, only kicks in when you need it. You'll need to use the tip of your thumb (or thumbs – you can ramp up your typing speeds by using both), but that's no hardship. There's loads packed into this very clever smart phone. But the really impressive thing is its size. Not that it's titchy – there's a good-sized 49x36mm screen with 16 million colours. But it is remarkably thin for a Symbian S60 smartphone at just 10mm at its thickest point – that's a couple of mm slimmer than the iPhone and 5mm less than the Blackberry Curve. The metal body probably adds a little weight, but it also feels very sturdy and at 127g it still nestles very easily in the pocket. There's just about enough room on the sides for volume up and down plus a dedicated voice notes button (probably more useful for the E71's intended audience than a camera shutter button, if not really as much fun). On the other side there's a mini USB port and microSD slot which you should find comes with a 2GB memory card, though it can handle up to 8GB. On the front above the keyboard are four shortcut keys (home, calendar, contacts and messages) surrounding the square D-pad which lights up and doubles as the alert light, letting you know when you have messages waiting. All your favourite apps are displayed on that deliciously bright home screen, including mailbox, email set-up, VoIP set-up (the networks probably aren't too happy about that), latest calendar entries and voice messages, plus Wi-Fi scanner. Incidentally, you can set up two profiles, one for work, one for leisure, so you can split your personality on the one device. For connecting, as well as Wi-Fi and USB, there's also advanced data rate Bluetooth that can handle stereo (another one up on the iPhone), infrared, and a 3.6Mbps HSDPA 3G connection. Pretty much everything you could need in other words. Wi-Fi proved to be easy to set up (as did the push email and virtually everything else we tried on this phone) and we were getting broadband internet access in less than a minute. Web browsing felt good too, with the screen's 320x240pixel landscape proportions rendering web pages well. The browser's had a bit of thought gone into it as well, allowing you to zoom in and out, flip through past pages, and opt for full-screen viewing – handy for streaming video. There's also the option of barring pop-ups and pictures, plus a useful text search function that allows you to zoom in on key words. The camera is a 3.2 megapixel type that, if not up there with Nokia's Nseries cameraphones, still delivers more than would be considered strictly necessary on this type of phone. It can offer up to 2,048x1,536 pixels resolution, LED photo light, autofocus, red eye reduction, plus an extended digital zoom, which magnifies even when you're on maximum resolution. Nokia's photo editing suite is one of the best available on contemporary cameraphones, with a wealth of options for sprucing up your pics. There's an A-GPS receiver backed up by Nokia Maps, which might not have Google Maps' access to aerial pics, but still offers a very decent sat-nav option. The screen's a bit on the small side compared to dedicated sat-navs for driving, but it's fine for finding your way around on foot, and for an extra £7 a month you can add voice direction. There's also geotagging so you can link location info to your pics when you upload them to your blog or a file-sharing site. The music player does everything it needs to with all the usual formats, including MP3, WMA and AAC. The 110MB onboard storage is a good start, though you can of course augment this with microSD card up to 8GB. There's also Nokia's very fine FM radio, though you'll need to use the so-so supplied headphones as an aerial – there's no 3.5mm jack plug (just a 2.5mm one – eh?) and no adaptor. This being a Symbian business phone, it comes with QuickOffice4 which allows you to read and create Word, Excel and PowerPoint documents as well as Adobe Reader for viewing PDFs. There's also a barcode reader, a text scanner (which worked very well when we tried it), a wireless presenter app, WorldMate travel info, Push To Talk option, a wireless keyboard connector and loads more. Power-wise the battery held up well over three days with moderate use, automatically switching off the Wi-Fi when it wasn't in use and the light sensor limiting the need for backlighting. This is a marvellous business phone, with only a couple of tiny niggles holding it back from being just about perfect. All business phones should be made this way.